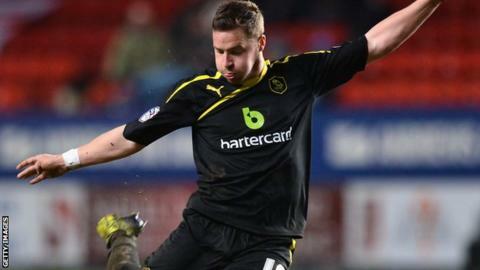 Barnsley's Emmanuel Frimpong was one of three dismissals as Chris Maguire scored in the 97th minute to hand Sheffield Wednesday a home victory. Just 24 hours after joining from Arsenal, Frimpong was yellow-carded twice in five first-half minutes. Wednesday substitute Jermaine Johnson followed him on 80 minutes while Reds midfielder Jacob Mellis joined them in injury time. Sheffield Wednesday are unbeaten in their last 10 games in all competitions, winning five. It proved costly for nine-man Barnsley as Maguire drilled home from 20 yards. Defeat leaves Danny Wilson's men still second from bottom, while the Owls find themselves six points clear of trouble after Stuart Gray's second game in permanent charge. As well as the hosts started, the first chance of note fell to Barnsley striker Nick Proschwitz, who was twice denied from a corner, first seeing his 12-yard volley blocked on the line by Liam Palmer, before Chris Kirkland saved the rebound. On 23 minutes, after being warned by referee Andre Marriner for persistent fouls, debutant Frimpong was finally booked - and it did not take long for him to pick up a second yellow when, five minutes later, he brought down Maguire with a clumsy challenge from behind. Then came the inevitable home pressure, but it was a scuffed goal-kick by Barnsley keeper Luke Steele that provided the first half's biggest chance - Maguire getting the ball stuck under his feet with Steele stranded wide of his goal. Wednesday struggled to seize control of the game, and an hour had been played before centre-back Oguchi Onyewu saw an effort tipped over, and Reds defender Jack Hunt headed his clearance onto the near post from the resulting corner. The Hillsborough crowd were growing agitated as their side struggled to fashion a clear-cut opening, frustration summed up by a thrashed 30-yard effort from Johnson that almost went out for a throw-in. That tension spilled over minutes later as the same player went in two-footed on Brek Shea and Marriner produced a red card to level it up at 10 men each. The Tykes went down to nine men in injury time after Mellis recklessly jumped in on Wednesday winger Jacques Maghoma, seemingly angered by the decision not to award him a penalty after he tumbled in the box 30 seconds earlier. And Barnsley were made to pay when substitute Jim O'Brien miscued a clearance in the 97th minute straight to Jose Semedo. He fed Maguire, who provided the day's one moment of real quality to settle an ill-tempered South Yorkshire derby. "Chris Maguire just keeps going and going all game. He kept going and only had one thing on his mind for the winner, which was going for goal. He doesn't hide. "I felt we rushed things in the build up when we were up against nine and 10 men but that's credit to Barnsley. We had a lot of possession but we didn't pepper the goal enough. "We all feel aggrieved because we think that we've been denied a stonewall penalty. "I know we should have had a penalty but the bottom line is that we have lost and that's hard to take. "I feel for the team as a whole because we were brilliant when we had 10 men. Mellis' red card was just stupidity but I think it was just frustration from the stonewall penalty being turned down. We could have won the game but instead we've lost it." Match ends, Sheffield Wednesday 1, Barnsley 0. Second Half ends, Sheffield Wednesday 1, Barnsley 0. Goal! Sheffield Wednesday 1, Barnsley 0. Chris Maguire (Sheffield Wednesday) right footed shot from outside the box to the bottom left corner. Assisted by Josè Semedo. Substitution, Sheffield Wednesday. Jeremy Helan replaces Oguchi Onyewu because of an injury. Caolan Lavery (Sheffield Wednesday) wins a free kick on the left wing. Delay in match Oguchi Onyewu (Sheffield Wednesday) because of an injury. Corner, Barnsley. Conceded by Miguel Ángel Llera. Foul by Oguchi Onyewu (Sheffield Wednesday). Nick Proschwitz (Barnsley) wins a free kick on the left wing. Jacob Mellis (Barnsley) is shown the red card. Foul by Jacob Mellis (Barnsley). Jacques Maghoma (Sheffield Wednesday) wins a free kick in the attacking half. Foul by Brek Shea (Barnsley). Corner, Sheffield Wednesday. Conceded by Thomas Kennedy. Hand ball by Jim O'Brien (Barnsley). Delay in match Brek Shea (Barnsley) because of an injury. Jermaine Johnson (Sheffield Wednesday) is shown the red card. Foul by Jermaine Johnson (Sheffield Wednesday). Brek Shea (Barnsley) wins a free kick in the defensive half. Attempt missed. Miguel Ángel Llera (Sheffield Wednesday) left footed shot from outside the box is high and wide to the left. Attempt missed. Jermaine Johnson (Sheffield Wednesday) left footed shot from outside the box is high and wide to the left following a set piece situation. Attempt blocked. Jacques Maghoma (Sheffield Wednesday) right footed shot from the centre of the box is blocked. Assisted by Caolan Lavery. Substitution, Barnsley. Tomasz Cywka replaces Jack Hunt because of an injury. Delay in match Jack Hunt (Barnsley) because of an injury. Offside, Barnsley. Jim O'Brien tries a through ball, but Nick Proschwitz is caught offside. Corner, Sheffield Wednesday. Conceded by Brek Shea. Substitution, Barnsley. Jim O'Brien replaces Dale Jennings. Foul by Jacques Maghoma (Sheffield Wednesday). Stephen Dawson (Barnsley) wins a free kick in the defensive half. Substitution, Sheffield Wednesday. Jermaine Johnson replaces Benik Afobe. Corner, Sheffield Wednesday. Conceded by Luke Steele.